I've said it before, I'll say it again. I'm a mint & chocolate combo addict. I need a support group, but until then I make yummy treats like these Chocolate-Mint Brownies from Cooking Light Magazine, which makes these lower in fat. While these brownies take patience and a bit of time to create, they are well worth the effort. I will even go so far out on a limb and say these are the best brownies I've ever had. Begin by melting 6 tablespoons of butter in a medium saucepan. Then stir in cocoa and milk, cooking for a minute. Then add the sugars and vanilla, cooking for another minute. Remove from heat and add the egg whites one at a time. Once thoroughly combined, add the flour, baking powder and salt. Pour the batter into a pan and bake at 325 degrees for 25 minutes. Once baked, cool on a wire rack. 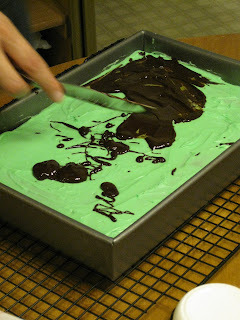 Once cooled, mix the frosting layer using 1 cup powdered sugar, 1 tablespoon of softened butter and mint extract. 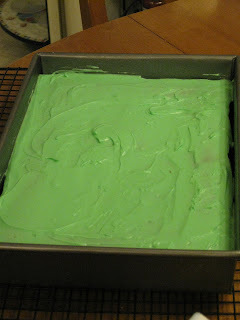 I also added some food color for that minty green look and added a little water because the frosting was lacking in moisture. The spread the frosting over the cooled brownies and refrigerate for 30 minutes. Once the 30 minutes is up, melt 1 ounce of unsweetened chocolate and 1 tablespoon of butter. 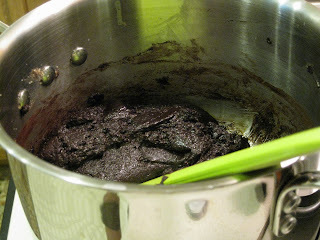 Then spread the mixture on top of the frosted brownies. Chill for 30 minutes. 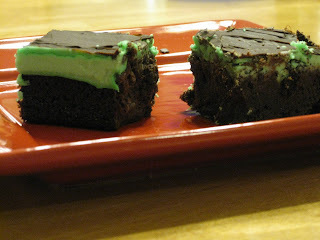 The final product is a whole lot of fudgy, minty wonderfulness. I hope you saved one for me. This looks almost exactly like a recipe my mom has been making for years and that I recently have adopted as my own. The only difference is the frosting is made with cream cheese, powdered sugar and mint extract. If you like a cheesecake-type flavor, I highly recommend you give it a try. Just take one box of cream cheese, soften it, add in powdered sugar to taste and mint extract to taste. Add milk if it's too stiff. Hope you both are well. I wish I had some foodies down here in Janesville to indulge with me... Let's get together soon, OK?